PacMan Adventures 3D game is a modern remake of classic arcade game Pac Man with real 3D scene and splendid music. 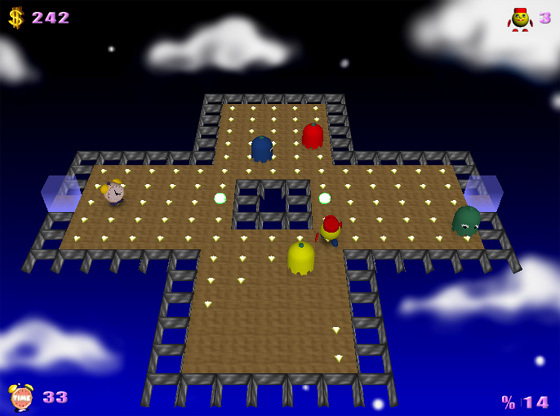 In the wonderful maze,you must feel your dexterity and sharpness, eat all of the dots to move to the next level, avoid or hunt back the monsters(after you eat power pills).There are 4 missions and 180 levels in the full version: Classic Adventure(50 levels),Big Adventure(50 levels),Need For Speed(50levels),Pac SokoBan(30 levels). ...... Need For Speed(50 levels),Pac SokoBan(30 levels). Not like other pacman games, PacMan Adventures 3D game also supports multiplayer mode, now you can adventure with your friend cooperatively or competitively in the magic land! PacMan Adventures 3D's excellent game control and challenging levels make this game very addictive,once you start to play,you may not stop! You can get a kid's version for free if you order a PacMan Adventures 3D game full version, so this non-violent game is entertaining and intriguing for the whole family. Qweas is providing links to PacMan Adventures 3D 2.052 as a courtesy, and makes no representations regarding PacMan Adventures 3D or any other applications or any information related thereto. Any questions, complaints or claims regarding this application PacMan Adventures 3D 2.052 must be directed to the appropriate software vendor. You may click the publisher link of PacMan Adventures 3D on the top of this page to get more details about the vendor.